Scollard DM. 18 September 2016, posting date. Pathologenesis and pathology of leprosy. In Scollard DM, Gillis TP (ed), International textbook of leprosy. www.internationaltextbookofleprosy.org. Mycobacterium leprae elicits a uniquely broad spectrum of clinical and pathological features from susceptible individuals. The basis for this diversity has been recognized to be the differing capability of individuals to develop a cellular immune response to M. leprae . This concept, based on histopathological evidence, antedated the recognition of T and B lymphocytes and has made leprosy a major model for the understanding of human cellular immunity (see Chapter 6.1). A practical five-part clinical and histopathological classification system was subsequently developed by Ridley and Jopling . Among patients with established lesions, the five-part Ridley-Jopling system classifies, at one extreme, individuals who exhibit a high degree of cell-mediated immunity and delayed hypersensitivity, presenting with a single, well-demarcated lesion with central hypopigmentation and hypoesthesia. Biopsies of such lesions reveal well-developed epithelioid granulomas and rare acid-fast bacilli; this category is termed polar tuberculoid (TT) disease (Figure 1). Caseous necrosis is rare in TT leprosy granulomas and when observed is almost always seen in granulomas involving nerves. FIG 1 The imunopathological spectrum of leprosy. This spectrum is the ‘yardstick’ against which is measured each new hypothesis and discovery regarding immunological mechanisms proposed to be responsible for the wide range of human cellular immune responses to M. leprae. From . Reprinted with permission. At the other extreme are patients who have little or no cellular immunity to M. leprae. A biopsy of diffuse infiltrates or raised or nodular skin lesions reveals sheets of foamy macrophages in the dermis, containing very large numbers of bacilli and micro-colonies called “globi.” The abundance of foamy cells may be mistaken for some form of histiocytosis if leprosy is not suspected and if Fite stains are not done to demonstrate the numerous acid-fast organisms. This immunologically non-M. leprae resistant, highly infected form of leprosy is termed polar lepromatous (LL). The majority of patients, however, fall into a broad dimorphous or “borderline” category between the two polar forms. The “borderline” category is sub-divided into borderline lepromatous (BL), mid-borderline (BB), and borderline tuberculoid (BT) disease, each with a correspondingly graduated bacterial load and organization of the inflammatory infiltrate (Figure 1). The histological features correlate well with the bacterial load, and these findings should be congruent. Specifically, if a well-organized tuberculoid granulomas response is seen, bacilli are scarce or rare; if a poorly organized lepromatous response is observed, with many foamy histiocytes, bacilli are abundant and easily demonstrated. In the World Health Organization’s (WHO’s) simplified clinical classification scheme, TT and BT types are identified as “paucibacillary” (PB) and types BB–LL as “multibacillary” (MB). These designations are based on counting the number of macroscopic lesions. This classification is useful in resource-limited situations with minimal medical facilities, but it is not appropriate when biopsy diagnosis and microscopic classification are available. Overall, the majority of patients are classified in the LL, BL, or BT categories, but the distribution of patients within the entire spectrum varies according to racial background (e.g., TT and BT types are more common in African populations, and LL and BL types are more common in Caucasian populations). Patients in the two polar groups (LL and TT) are relatively stable in their immunopathological response to M. leprae, but considerable shifts in immunological and clinical status can be observed in patients in the borderline (BL – BT) portion of the spectrum. These widely dimorphic histopathological responses are the result of a correspondingly broad range of cellular immune responses (see Section 6) to M. leprae. No unified immunological hypothesis has successfully explained how the entire range of cellular immunity can be expressed in response to this one organism. Evidence does indicate that patients in the tuberculoid portion of the spectrum have a Th-1 type of immune response to M. leprae, producing interleukin 2 (IL-2) and interferon-γ (IFN-γ) . At the other pole, lepromatous patients have a Th-2-like pattern, with little IL-2 or IFN-γ, but greater production of IL-4 and IL-10. Insufficient evidence has been produced to date, however, to establish clearly that a ‘titration’ of these cytokines exists along the entire borderline portion of the spectrum, and the mechanisms that generate this broad range of responses remain to be determined. Cutaneous lesions may show a range of histopathological appearances, from well-formed epithelioid granulomas to disorganized, linear or irregular aggregates of lymphocytes and histiocytes (Figure 1). The epidermis may be flattened and attenuated and typically is not hyperplastic or acanthotic. A sub-epidermal clear (Grenz) zone is seen in lepromatous lesions, but the granulomatous infiltrates may extend up to the basal layer of the epidermis in tuberculoid lesions. Perineural inflammatory infiltrates (Figure 2) should prompt consideration of a diagnosis of leprosy, and a Fite-Faraco stain should be performed; demonstration of acid-fast bacilli within nerves is pathognomonic of leprosy. However, the vast majority of M. leprae in the dermis are within histiocytes; they may also be found within endothelial cells and arrector pili muscle. Dermal appendages may be inflamed and destroyed, and the destruction of sweat glands and sebaceous glands can result in dryness of the affected skin. Destruction of hair follicles (illustrated in Figure 1, ‘BB’) leads to loss of hair, most conspicuous as madarosis. Leprosy rarely involves the scalp, possibly because it is warmer than the optimal growth temperature for M. leprae. FIG 2 Inflammation and infection of cutaneous nerves across the leprosy spectrum. The inflammatory responses in and around cutaneous nerves are shown in the upper panel; arrows highlight recognizable nerve twigs. The immunopathological classifications of leprosy, TT–LL, are indicated at the top of the figure (see text; mid-borderline, BB, is not shown). Very early leprosy lesions, including some cases with a single lesion, may present as relatively non-specific perineural infiltrates in which rare acid-fast bacilli can be demonstrated, but without sufficient infiltrates to classify them. These lesions are called “indeterminate” (Figure 3). Care should be taken to use this term only when the biopsy shows definite, diagnostic evidence of leprosy (nerve involvement and acid-fast bacilli), since a diagnosis of leprosy very often has a significant impact on the patient’s mental and physical health, social status, and employment, and also impacts the patient’s family. The pathognomonic histopathological feature of leprosy is infection of the nerves by acid-fast organisms  (Figure 2). This infection is usually observed in cutaneous nerves, but is also seen in biopsies of the sural nerve or a sensory branch of the radial cutaneous nerve. M. leprae ultimately infect both intraneural macrophages and Schwann cells. The range of pathological changes in nerves (see Chapter 9.1) generally recapitulates that seen in the dermis. In lepromatous lesions, nerves may be highly infected, with a minimal inflammatory response (Figure 2). 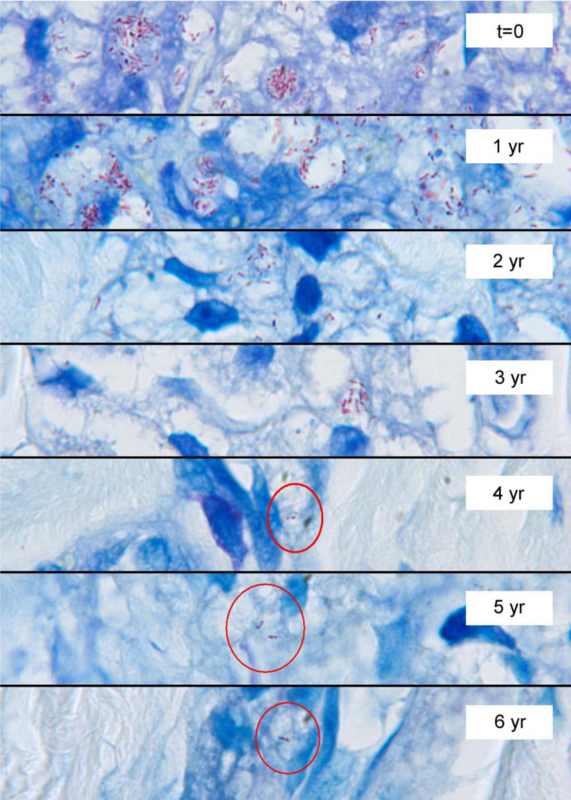 In tuberculoid lesions, bacilli may be rare and difficult to demonstrate, but pronounced, focal granulomatous inflammation may replace nerves (Figure 2). Nerves in borderline lesions present a variety of intermediate patterns. ‘Pure neural’ leprosy, without skin lesions, is seen in 1–2% of cases, and can only be diagnosed by nerve biopsy . A nerve biopsy is seldom performed, however, limiting the information directly available regarding the mechanisms of nerve injury, but sensitive imaging techniques  and animal modeling (in the armadillo; see Chapter 10.2) may soon enable a better understanding of the pathogenesis of nerve injury (see Chapter 9.2) in leprosy . Infection of the nasal mucosa, sometimes presenting as a nasal polyp, may reveal a diffuse histiocytic infiltrate that may be misinterpreted as a form of histiocytosis, but upon Fite staining, reveals abundant acid-fast organisms (Figure 4). The upper respiratory tract is widely believed to be the usual portal of entry of M. leprae, although firm evidence is lacking. Infection of the cartilaginous tissues of the nose may lead to perforation of the septum, and inflammation of the auricular pinnae often produces characteristic nodular thickening of the ears. Both the hard and soft palates may be involved, sometimes leading to septal ulceration and perforation if not treated . In advanced disease, the posterior pharynx and epiglottis may also be infected  (Figure 5). Laryngeal involvement with stridor may be seen in very advanced cases and can lead to thickening of the mucosa (Figure 5D, 5E) and fatal laryngeal obstruction. The Mycobacterium leprae infection does not extend to the lung, presumably because the warmer environment is not conducive to the survival and proliferation of the bacilli. FIG 4 M. leprae infection of nasal mucosa. Sections of a clinically suspected nasal polyp (A) reveal a loose, disorganized infiltrate of foamy histiocytes and lymphocytes, initially mistaken for some type of histiocytosis (H/E, 20×). Fite stains (B), however, revealed large numbers of acid-fact bacilli within histiocytes (Fite, 1000×). If nerves cannot be examined in the specimen, so that the capability of the organisms to infect nerves cannot be determined, the possibility of atypical mycobacteria should also be considered (e.g., Figure 9). Cultures for atypical mycobacteria should be performed, and molecular identification by nucleic acid amplification techniques such as PCR may be indicated. FIG 5 Advanced lesions of oropharynx. The natural progression of lepromatous leprosy in the oral cavity is documented in watercolor illustrations prepared by Yoshie  in the 1930s, prior to the discovery of effective treatment. 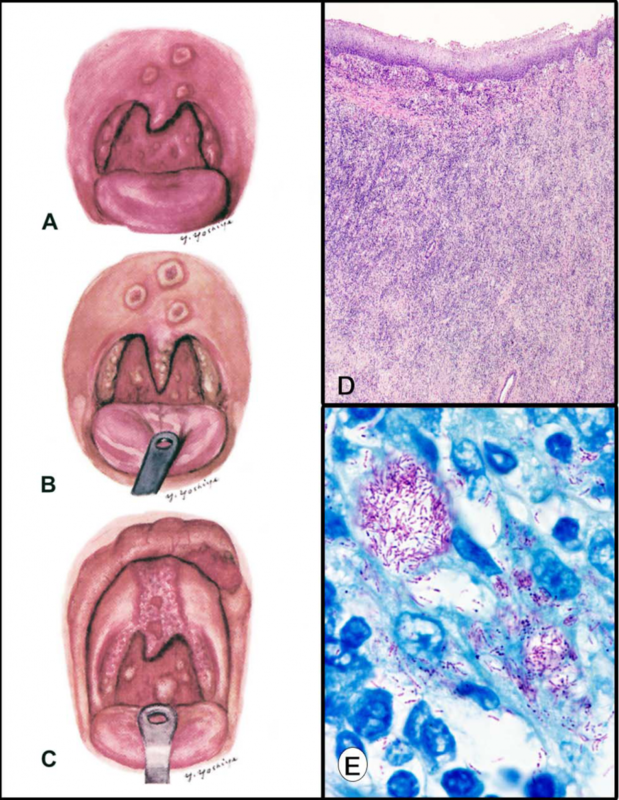 In a man with leprosy of 17 years’ duration, initial phayngoscopy (A) revealed plaques on the soft palate, infiltration and deviation of the uvula, and nodules on posterior pillars and tonsils. A re-examination five months later (B) revealed discoloration of the soft palate, ulceration of previous lesions, elongation of the uvula, and coalescence of lesions on pillars and tonsils. After another 13 months (C), the hard and soft palates were ulcerated and deep ulcerations on the soft palate had reached the muscularis. The tongue and lips were also infiltrated. (From . Reprinted with permission). 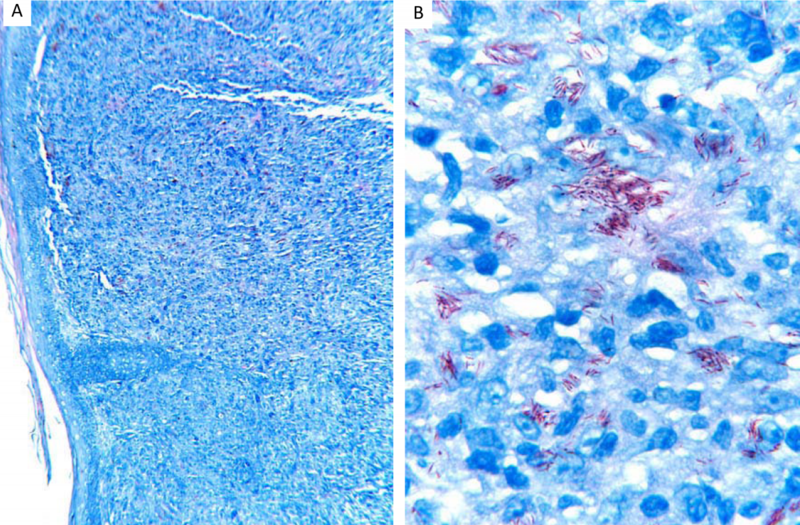 Post-mortem examination of a different patient, who died of laryngeal obstruction after long-standing, untreated lepromatous leprosy, revealed (D) thickening of the submucosa of the laryngeal folds due to extensive, disorganized lepromatous infiltrates of lymphocytes and foamy histiocytes. Fite stains (E) disclosed abundant acid-fast organisms throughout the infiltrate. (D, H/E, original magnification 20×; E, Fite, original magnification 1000×). Mycobacterium leprae is weakly acid-fast. Some bacilli will stain with the Ziehl-Neelsen technique, although this stain can be negative; a higher percentage of bacilli will be stained by the Fite method  (Figure 6). Nevertheless, M. leprae cannot be reliably distinguished from other mycobacteria by histochemical staining, and the identity of the bacilli may be determined by nucleic acid amplification techniques such as the polymerase chain reaction (PCR; see Chapter 7.2) or suggested by other clinical findings that indicate leprosy. FIG 6 Staining of M. leprae. The portal of entry for M. leprae is widely believed to be the nose, although skin-skin transmission has not been excluded. The earliest lesions in the nasal mucosa cause mild, non-specific symptoms and are not biopsied, so the histopathological features of this lesion are not known. Established nasal lesions are sometimes biopsied. Reported nasal lesions ,  are typically lepromatous, with abundant bacilli (Figure 4). Tuberculoid granulomas may occur but probably cause such minor symptoms that they are usually not biopsied. Hematogenous dissemination is the likely mechanism of the spread of bacilli. In lepromatous patients, M. leprae may be found in buffy-coat preparations during hematogenous spread of the infection (Figure 7A), although it is not usually accompanied by fever or other systemic symptoms. Although M. leprae prefers cooler temperatures, it can infect and survive for at least some time in deep tissues. M. leprae are, therefore, occasionally encountered in biopsies of the lymph node, liver, or bone marrow (Figure 7B, 7C). Autopsy series published long ago have documented the ability of M. leprae to produce an infection in many organs , , ,  that is apparently transient, due to the higher temperature in these visceral sites. Many of the visceral infections described—such as of the adrenal glands or spleen—were seen after many years of infection. These transient infections are now seen very rarely, because effective antimycobacterial treatment interrupts the progression of the infection. M. leprae are not seen in the human lung and have only rarely been described in the kidney. Glomerulonephritis may occur in leprosy patients, and although an immune-complex pathogenesis involving M. leprae antigens has been hypothesized, it has not yet been proven , . In the past, renal dysfunction due to amyloidosis was not uncommon in advanced cases but is very uncommon today. This change may be due to effective anti-mycobacterial treatments that reduce the long-term bacterial burden and inflammation formerly seen in progressive infections. The infection of the testes is still observed in lepromatous leprosy, and the irreversible destruction of Sertoli cells often results in hypogonadism and gynecomastia in patients who are not diagnosed until their infection has been present for several years. FIG 7 Systemic infection by M. leprae. Hematogenous dissemination of M. leprae occurs during the course of this infection and bacilli may occasionally be demonstrated in buffy coat preparations (A). Occasionally M. leprae may also be seen in bone marrow (B) and liver biopsies (C). Since M. leprae is not cultivable, and it may not be possible to document infection of nerves in deep tissues, nucleic acid amplification techniques such as PCR may be necessary to confirm its identity in such instances. 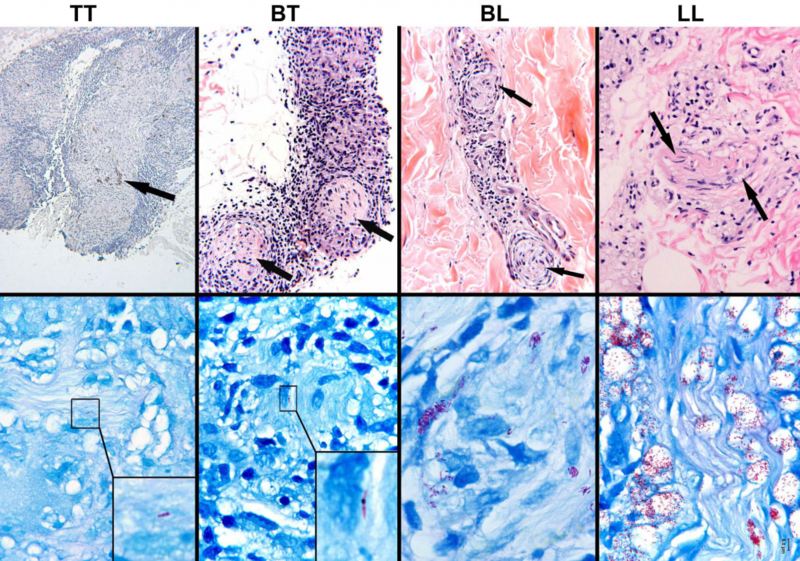 Bone marrow may be infected with M. leprae in lepromatous patients  (Figure 7C). The infection is sometimes encountered in bone marrow biopsies performed to evaluate a fever of unknown origin or other indications in which tuberculosis is being considered. Anemia occurs in leprosy and is usually attributed to chronic disease or as a side effect of dapsone treatment. Although marrow may be heavily infected focally, there is no clear evidence to indicate that infection of the marrow can cause functional suppression or anemia. Contrary to folklore, the fingers and toes of people with leprosy do not “drop off.” Lepromatous osteomyelitis and periostitis may occur in advanced lepromatous disease, leading to the erosion of bone. Bone loss occurs in anesthetic, paralyzed fingers or toes and is a late, advanced consequence of infection and injury to the peripheral nerves proximal to the wound or ulcer. Trauma to anesthetic limbs in any type of leprosy may result in ulceration and, without diligent care of early injuries, secondary infections may culminate in secondary osteomyelitis due to common Gram-positive or -negative organisms. M. leprae are not likely to be found in biopsies of such ulcer margins or necrotic bone, which instead will show non-specific changes of secondary infection, necrosis, and fibrosis. Even in patients who take very good care of their insensitive limbs, the damage to parasympathetic innervation of blood vessels can result in the absorption of bone in phalanges. This absorption can be extensive, even resulting in the absorption of all digits from an extremity . Transient, focal infections by M. leprae may occur in the liver in patients with lepromatous disease. The bacterium will occasionally be seen in percutaneous liver biopsies and be mistaken for M. tuberculosis  (Figure 7D). However, M. leprae does not produce long-standing lesions in the liver and these transient, focal infections do not result in hepatic dysfunction. Nearly all damage to the eyes in leprosy (see Chapter 3.1) is secondary to impairment of the facial and trigeminal nerves, resulting in lagopthalmos, anesthesia, and drying of the cornea. The corneal scarring that may result is histologically non-specific. A primary infection of the nasolacrimal glands is occasionally observed in lepromatous patients. The cornea and conjunctiva can be infected, although this outcome is now very uncommon. Rarely, M. leprae may infect the iris ; however, the posterior compartment of the eye and the retina are not directly damaged by M. leprae. Immunologically initiated inflammatory episodes, collectively termed “reactions” (see Chapter 2.2), affect approximately 40% of leprosy patients. The clinical findings may be very dramatic and distressing, sometimes prompting hospitalization. Type 1 reactions (T1R, reversal reactions) affect patients in the borderline portion (BL–BT) of the spectrum, presenting as the exacerbation of erythema and tenderness of pre-existing lesions, often with pronounced acral edema. Histologically, the findings in T1R skin lesions are often non-specific and do not correlate well with the severity of clinical findings . Dermal edema, increased granulomatous organization, and an increased number of multinucleated giant cells may be observed (Figure 8B), but approximately half of these lesions do not show significant histopathological differences from non-reacting lesions. Therefore, histopathological examination is not a definitive tool for the diagnosis of this reaction. Substantial evidence indicates that T1R are the result of the spontaneous enhancement of cellular immune responses to M. leprae, with increased numbers and percentages of CD4+ T-cells and the increased expression of genes for Th1 cytokines including IFN-γ and tumor necrosis factor α (TNF-α). Type 2 reactions (T2R, erythema nodosum leprosum, ENL) occur in patients with lepromatous (LL–BL) disease, i.e., patients with a high bacterial load and antibodies to mycobacterial antigens, but little or no cellular immunity to M. leprae. These reactions typically develop abruptly, with crops of red, tender nodules on various parts of the body. The natural course of T2R is typically 10–14 days, but without prompt treatment severe tissue damage often results, including damage to nerves. T2R is widely believed to be an immune-complex-mediated disorder , although the evidence is circumstantial. Biopsies of lesions <24 hours old reveal acute inflammation, with focal infiltrates of polymorphs superimposed upon the chronic inflammation of lepromatous leprosy (Figure 8C, 8D). The bacterial load is usually lower in the immediate vicinity of the acute inflammatory infiltrate. In older T2R lesions, polymorphs may not be found . Corticosteroids and thalidomide reduce the inflammation in T2R and may result in the absence of polymorphs from the lesion. Many patients have multiple, recurrent episodes of T2R. The Lucio reaction is a rare form of a toxic, necrotizing vasculopathy that usually occurs in long-standing, untreated lepromatous disease with diffuse infiltration of the skin ,  and that may result in extensive exfoliating dermopathy. Most cases occur in individuals whose ancestry can be traced to the region of Sinaloa, Mexico, suggesting that a genetic predisposition may underlie this reaction. The Lucio reaction is associated with both M. leprae and M. lepromatosis  (Ochoa et al., manuscript in preparation). Since neither of these organisms is known to secrete a toxin, the reaction appears to be due to the unique immunological reactivity of the host rather than to specific properties of either of these mycobacteria. Histologically, the lesions are characterized by fibrin thrombi within cutaneous blood vessels (Figure 8E) and subsequent necrosis of the skin. In Lucio lesions, vascular endothelial cells are often heavily infected by M. leprae (Figure 8F), but infection of these cells is not diagnostic in itself, since the infection of endothelial cells has long been documented in lepromatous disease . Unlike ENL, these lesions are not characterized by infiltrates of polymorphs, but it is possible that some patients have both reactions simultaneously. The Lucio reaction may result in the necrosis of large areas of skin and may rapidly progress to severe exfoliation with the necrosis of underlying structures, including tendons and bone. The Lucio reaction is one of the few causes of death due to Hansen’s disease (HD) , although, if the diagnosis of leprosy is known and this syndrome is recognized, it can be managed with intensive supportive care. The pathogenesis of the Lucio reaction is not understood but the process appears to resemble a cutaneous infarct. 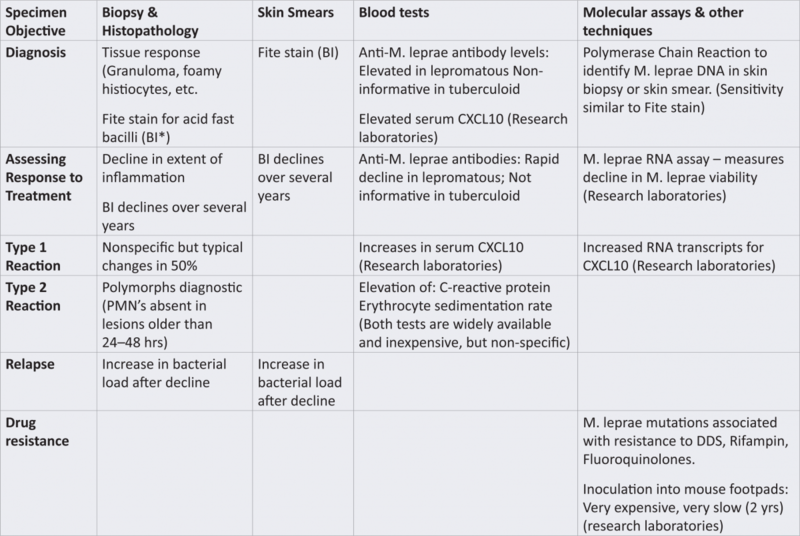 FIG 8 Histopathological appearances of leprosy reactions. Moderate to high doses of corticosteroids are used to treat all types of leprosy reaction, and thalidomide is used to treat T2R. This treatment can mask inflammatory signs of reaction such as edema and polymorph infiltration; therefore, it is important to inform the pathologist about treatment with corticosteroids or thalidomide to assist in the optimal interpretation of skin biopsies. Corticosteroid treatment may also allow previously asymptomatic co-infections (see Chapter 3.4) to become manifest. A number of parasitic and vital infections should be considered in biopsies from such corticosteroid-treated patients. Tuberculoid leprosy (TT and BT) may be histologically indistinguishable from cutaneous tuberculosis, and acid-fast organisms are often rare and difficult to demonstrate in either infection . Caseation rarely occurs in tuberculoid leprosy, however, and the involvement of cutaneous nerves is not seen in tuberculosis. If the granulomas are well formed, with a scanty lymphocytic component, the lesion may be histologically indistinguishable from sarcoidosis, and details of the history and physical exam may be necessary to determine the correct diagnosis. Leprosy and sarcoidosis have been seen in the same patient , although this co-occurrence is difficult to document. Granuloma annulare, necrobiosis lipoidica, and granuloma faciale are other lesions that are sometimes mistaken for tuberculoid leprosy clinically and histologically. Less commonly, the granulomas of tuberculoid leprosy are mistaken for systemic lupus erythematosis and other autoimmune disorders. The abundant, disorganized aggregates of foamy histiocytes seen in lepromatous leprosy (LL and BL) may be mistaken for some form of histiocytosis in routine hematoxylin and eosin sections. In such a disorganized infiltrate, a Fite stain will demonstrate a large number of acid-fast organisms within the histiocytes if this pattern is due to leprosy. To diagnose leprosy, however, it is important to demonstrate bacilli within cutaneous nerves, or by molecular techniques (see Chapter 7.2), or to exclude other mycobacteria by the lack of growth in culture. In immuno-suppressed or immuno-compromised patients, other mycobacteria that do not infect nerves may produce a histological picture easily confused with lepromatous leprosy (Figure 9). The Fite stain assists in detecting weakly acid-fast mycobacteria such as M. leprae, but it is not specific, since the technique enhances acid-fastness of all mycobacteria, all of which will stain with this method. FIG 9 Mycobacterium haemophilum infection simulating lepromatous leprosy. Perineural inflammation is the hallmark of leprosy, but this inflammation may also be seen in some other infections such as secondary syphilis and herpes, as well as in sarcoidosis, scleroderma, and some cutaneous lesions of chronic lymphocytic leukemia . Leprosy reactions may cause confusion histologically, especially if the diagnosis of leprosy is not already known or divulged. If the patient is known to have leprosy, an infiltrate of neutrophils superimposed upon a chronic, disorganized histiocytic infiltrate should suggest Type 2 reaction; if a Fite stain has already disclosed numerous bacilli, this diagnosis is not difficult. However, polymorphs are only transiently present in these lesions, and they may not be present in a biopsy taken from lesions >24 hours old. Hence, the inability to demonstrate polymorphs does not exclude the diagnosis of T2R. If leprosy has not already been diagnosed or divulged, Type 2 reactions are sometimes clinically mistaken for sepsis or cellulitis and histologically mistaken for cellulitis or Sweet’s syndrome. Infiltrates in the BL–BT forms of leprosy may suggest a Type 1 reaction if there are a large number of multinucleated giant cells or if the dermis is notably edematous. As noted above, however, these features are not pathognomonic. A histological examination may not provide confirmation of T1R, and the diagnosis must often be made on clinical grounds alone. The severe, necrotizing vasculopathy of the Lucio reaction may be mistaken clinically for severe fasciitis or anti-phospholipid syndrome if there is no prior diagnosis of leprosy. This reaction often presents as a life-threatening emergency in patients not known to have leprosy, but other clinical signs (e.g., madarosis or nasal septal perforation) may suggest the underlying diagnosis of leprosy. Large numbers of dead M. leprae may persist as “foreign bodies” for several years after the killing of all M. leprae by effective multi-drug therapy (MDT) (Figure 10). Laboratory studies have demonstrated the highly bactericidal effects of the antimicrobial agents used in MDT (see Chapter 5.2), and global clinical experience with 1–2 years of MDT has demonstrated that this regimen is highly effective. After they are dead, however, M. leprae are handled by the body as particulate foreign material and are eliminated by a slow, physiological process of removal. There is no evidence that continued antimicrobial treatment hastens this process. Thus, in lesions that were initially highly infected, bacilli and bacillary fragments may be seen in biopsies for several years after the initiation and successful completion of MDT  (Figure 10). This slow decline is counter-intuitive and challenging for inexperienced physicians and pathologists to interpret. Leprosy reactions are common, as discussed above, but a relapse is rare. Thus, when patients who have completed a full course of MDT present with new lesions, these are much more likely to be due to a leprosy reaction than to a relapse of infection, even if residual, dead bacilli are observed in the tissues. The antigens of dead M. leprae may still provoke immunological responses and reactions. True relapses of M. leprae infection are seen primarily in endemic countries, 10–15 years after the completion of treatment , , and are very rare in the United States. FIG 10 Slow decline of M. leprae in skin after treatment. Representative portions of sequential, annual biopsies of skin lesions from one lepromatous patient are shown, starting with the initial pre-treatment biopsy (t = 0). The patient was treated with the MDT regimen recommended by the National Hansen’s Disease Programs (USA): daily rifampin, dapsone, and clofazimine. Bacterial morphology had changed at one year; organisms were numerous but showed evidence of degeneration. The treatment was discontinued at the time of the biopsy, taken at two years. Very few specific and sensitive laboratory tests are available for the diagnosis and management of leprosy. Nevertheless, some laboratory tests are helpful when interpreted with close clinical correlation (Table 1). Details and references for these tests are provided in the text. *BI – Bacterial index, a semi-quantitative measure of bacterial load obtained by manual counting of bacilli per oil-immersion field. The basic laboratory support for the diagnosis of most infectious diseases—culture of the pathogen—is not possible with M. leprae. A biopsy of a cutaneous lesion and the demonstration of acid-fast bacilli within the nerves remains the ‘gold standard’ method to confirm the diagnosis. The Fite stain should be used, as standard Ziehl Neelsen stains may be negative (Figure 6). Another method for the detection of M. leprae in the skin is the slit-skin smear . This smear is performed by making a shallow incision into the dermis with a sterile scalpel or razor blade, without anesthesia, then quickly turning the blade 90° and scraping it through the incision to collect a few microliters of dermal fluid, which is smeared onto a microscope slide. A smear is usually taken at six standard sites (bilaterally at the ear lobes, elbows, and knees), sometimes with additional selected sites at observed skin lesions. These preparations are air-dried and heat fixed, and, after Fite staining, the smear for each site is examined microscopically. The number of acid-fast organisms per oil-immersion field is scored as the Bacteriologic Index (BI) on a scale of 1–6, as illustrated in the Appendix. The main advantages of this technique are that multiple sites are assessed, potentially reducing the sampling variation seen in biopsies, and that the skin smears can be prepared, stained, and read in resource-limited circumstances in which access to pathology services is not available . A serious disadvantage of skin smears is that the sampling at each skin site is not standardized (some technicians make a longer or deeper incision than others), which greatly impairs the objective of quantitative comparisons of skin smears. It is very important that the smears be done by the same person all of the time to reduce sampling variations. Another limitation of the test is that it only assesses bacterial load and does not give any information about the tissue response, which can be gleaned from biopsies. In addition, it is necessary for optimal results that the smears be stained and evaluated by the same person in order to reduce technical and inter-observer variations. When sampling, staining, and reading are consistently performed by the same persons, the method enables an assessment of the bacterial load over time (usually annually) that correlates well with biopsy observations . Because of the great difficulty in maintaining a high standard of technical expertise in performing these smears , , however, the technique is becoming less widely available and more physicians rely on repeat biopsies as a laboratory assessment of the response to treatment. The absence of acid-fast bacilli in biopsies or skin smears does not entirely exclude the diagnosis of leprosy, because in tuberculoid lesions and many early and indeterminate lesions, bacilli may be very difficult to demonstrate and require examination of all oil-immersion fields in multiple serial sections. 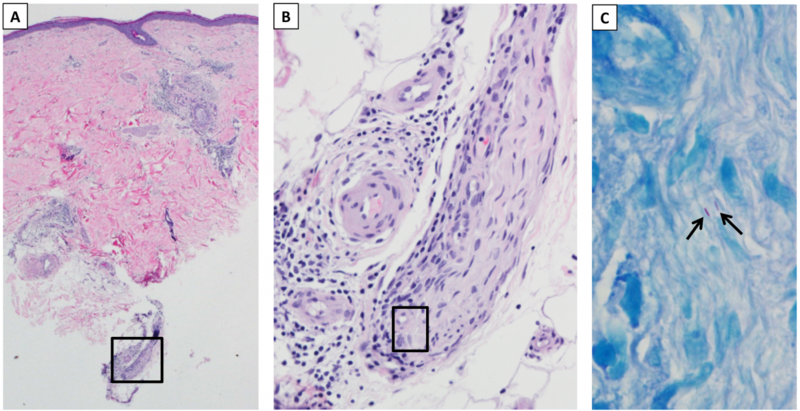 In these cases, the presence of granulomatous inflammation and/or perineural inflammation are features consistent with the diagnosis, but these findings must be interpreted within the clinical context, including travel history and possible exposure, dermatological findings, and the presence of nerve enlargement or sensory impairment. The identification of M. leprae DNA or RNA by various nucleic acid amplification techniques (i.e., PCR; see Chapter 7.2) is very useful for the identification of the pathogen, but often is not more sensitive for the detection of the organism than standard Fite staining and histological examination , , . Because of the possibility of false positive tests due to environmental contamination or other causes, it is unwise to rely entirely on PCR for the diagnosis of leprosy until at least one additional confirmatory test is available to validate positive results. The interpretation of PCR results is best done within the context of the clinical findings and the histopathological evaluation of the type of tissue response in a lesion. Immunological tests (see Chapter 7.1) for the diagnosis of leprosy have been attempted for several decades. No single immunological test is helpful in the diagnosis or management of leprosy because immunological responses to M. leprae vary widely across the leprosy spectrum. Tests for antibodies to M. leprae antigens are technically straightforward but only positive in those patients with lepromatous disease. Most tests for cellular immunity to M. leprae involve the tissue culture of mononuclear cells from peripheral blood. These cultures are only positive for those with tuberculoid disease and they are not field-friendly, generally requiring sophisticated laboratory facilities. Field-friendly tests for the chemokine CXCL10 have shown promise in detecting cellular immune responses to M. leprae , but the full value of these tests remains to be determined. No good laboratory tests are available for assessing the response to treatment. A decline in bacterial load can be estimated by skin smears or in biopsies, but this decline takes years. Furthermore, the decline is not correlated with the death of bacilli, because the dead bacterial particles may persist in the tissue for several years (as discussed above). Tests for anti-M. leprae antibodies decline rapidly after the start of treatment, but thus far there is no good evidence that they correlate with the death, or time of death, of M. leprae. The best laboratory assessment at this time is the histopathological evaluation of biopsies taken during and after treatment (usually annually), comparing these to the initial biopsy in much the same manner as radiologists evaluate the regression of tissue lesions by comparing sequential radiographs. There are no specific histological changes diagnostic of Type 1 reactions, and typical changes (edema, increases in giant cells) are seen in only 50% of cases . Increases in cellular immunity can be demonstrated by cellular assays of peripheral blood mononuclear cells, but these assays are usually available only in research laboratories. Increases in circulating CXCL10 appear to be correlated with Type 1 reactions and field-friendly tests are being evaluated currently . The observation of polymorphonuclear leukocytes in the biopsies of lesions of Type 2 reactions is diagnostic of this reaction, but may be missed if the lesion is more than 48 hours old. Elevated levels of C-reactive protein and elevated erythrocyte sedimentation rates are useful in supporting the clinical diagnosis of T2R , , . These are very non-specific tests, however, and must be interpreted with the consideration of other possible acute inflammatory problems such as infections in cutaneous ulcers or osteomyelitis. Fortunately, a relapse is rare in leprosy ; new lesions appearing during or after the completion of treatment are usually due to reactions (see Chapter 2.2). A relapse is defined by the re-appearance of M. leprae in skin biopsies or skin smears after the bacterial load in previous specimens has declined to zero. Documentation of this recurrence requires access to the results of earlier biopsies or skin smears. True relapses are usually seen more than ten years after the completion of treatment. Reactions are common, and relapses are rare. A relapse is not distinguished by any characteristic histologic pattern or by any morphologic features of the bacilli. ‘Histoid’ leprosy is a morphological variant of lepromatous disease, in which the macrophages have a spindle-cell appearance and are filled with large numbers of M. leprae. This variant has been proposed to be associated with relapsed disease but the evidence is not convincing . This histoid appearance has also been seen in biopsies prior to treatment , and in our own experience, this association is more common. Drug resistance (see Chapter 5.2) of M. leprae is rare , but may be associated with a relapse. There are no histological features for distinguishing infections with susceptible versus drug-resistant organisms. Currently, resistance is usually demonstrated by the identification of drug-resistance-associated mutations in M. leprae (see Chapter 5.2) that are isolated from biopsies . The results can be obtained within a short time. Mouse foot pad testing for drug resistance is no longer performed, except in research laboratories, and is not useful for clinical management because the results are not available for one year at a minimum. Detection of M. leprae nucleic acids, e.g., by PCR, offers a good identification tool when bacilli are observed in Fite-stained sections, but these molecular techniques are not usually better than a Fite stain at detecting bacilli. A Fite stain enhances acid-fastness and therefore aids in detecting weakly acid-fast organisms such as M. leprae, but this stain is not specific for M. leprae. The demonstration of acid-fast bacilli within nerves is pathognomonic of leprosy. M. leprae may occasionally be found in biopsies of liver or bone marrow. 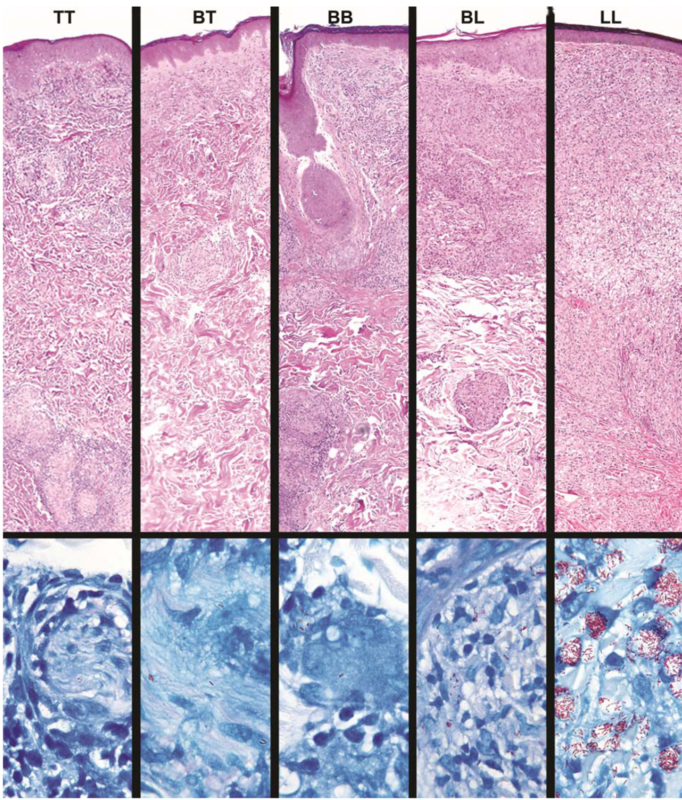 Histopathological features may be helpful in the diagnosis of Type 2 leprosy reactions (ENL) and the Lucio reaction, but are less helpful in diagnosing Type 1 reactions. Dead M. leprae may remain in tissues for several years. Dead M. leprae are slowly removed from the body as ‘foreign particles’. Prolonged antimycobacterial treatment does not hasten this process. The author is indebted to Steve Keas and Angelina Deming for their expert preparation and staining of tissue sections and to Greg McCormick and Jerry Simmons for their invaluable assistance in assembling the figures. ^ Skinsnes OK. 1964. The immunopathologic spectrum of leprosy, p 152–182. In Leprosy in theory and practice. John Wright & Sons Ltd, Bristol. ^ Ridley DS, Jopling WH. 1966. Classification of leprosy according to immunity – a five-group system. Int J Lepr Other Mycobact Dis 34:255–273. a, b Scollard DM, Adams LB, Gillis TP, Krahenbuhl JL, Truman RW, Williams DL. 2006. The continuing challenges of leprosy. Clin Microbiol Rev 19(2):338–381. a, b Scollard DM, Truman RW, Ebenezer GJ. 2015. Mechanisms of nerve injury in leprosy. Clin Dermatol 33(1):46–54. ^ Job CK. 1989. Nerve damage in leprosy. Int J Lepr Other Mycobact Dis 57:532–539. ^ Garbino JA, Marques Jr W, Barreto JA, Heise CO, Rodrigues MMJ, Antunes SL, Soares CT, Floriano MC, Nery JA, Trindade MAB, Carvalho NB, de Andrada NC, Barreira AA, da Cunha Lopes Virmond M. 2013. Primary neural leprosy: systematic review. Arq Neuropsiquiatr 71(6):397–404. ^ Garbino JA, Heise CO, Marques Jr W. 2016. Assessing nerves in leprosy. Clin Dermatol 34(1):51–58. ^ Sardana K, Goel K. 2014. Nasal septal ulceration. Clin Dermatol 32(6):817–826. a, b Yoshie, L. 1982. Leprosy of the upper respiratory tract. Shobido Printing House, Tokyo. a, b Scollard DM, Skinsnes OK. 1999. Oropharyngeal leprosy in art, history, and medicine. Oral Surg Oral Med Oral Pathol Oral Radiol Endod 87(4):463–470. a, b, c Scollard DM. 2014. Leprosy. In Procop G (ed), Pathology of infectious diseases. Elsevier, New York, NY. ^ Camacho ID, Burdick A, Benjamin L, Casiano R. 2011. Chronic rhinitis: a manifestation of leprosy. Ear Nose Throat J 90(9):E1–3. ^ Desikan KV, Job CK. 1970. 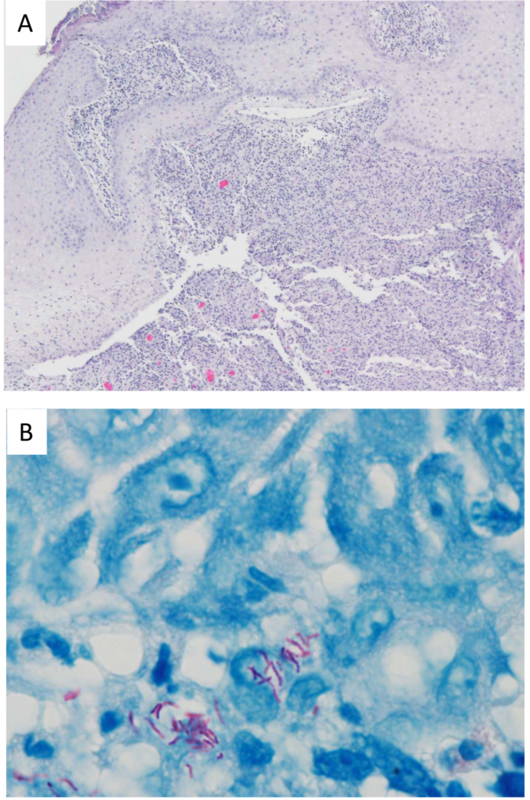 Visceral lesions caused by M. leprae—a histopathological study. Indian J Pathol Bacteriol 13(3):100–108. ^ Klingmüller V. 1930. Die lepra. In Jadassohn J (ed), Handbuch der Haut und Geschlectskrankheiten. Verlag von Julius Springer, Berlin, Germany. ^ Job CK, Dharmendra. 1985. Leprosy. Vol. 2. Bombay Samant and Co.
^ Ridley DS, Job CK. 1985. The pathology of leprosy, p 100–133. In Hastings RC (ed), Leprosy. Churchill Livingstone, New York, NY. ^ Ng WL, Scollard DM, Hua A. 1981. Glomerulonephritis in leprosy. Am J Clin Pathol 76(3):321–329. ^ Sharma A, Gupta R, Khaira A, Gupta A, Tiwari SC, Dindi AK. 2010. Renal involvement in leprosy: report of progression from diffuse proliferative to crescentic glomerulonephritis. Clin Exp Nephrol 14(3):268–271. a, b Velasco D, Lozano S, Villarrubia J. 2013. Leprosy diagnosed by bone marrow aspiration. Br J Haematol 160(2):121. ^ Møller-Christensen, V. 1961. Bone changes in leprosy. Munksgaard, Copenhagen, Denmark. ^ Carus NH, Raizman MB, Williams DL, Baker AS. 1995. Relapse of Mycobacterium leprae infection with ocular manifestations. Clin Infect Dis 20(4):776–780. a, b Lockwood DN, Lucas SB, Desikan KV, Ebenezer G, Suneetha S, Nicholls P. 2008. 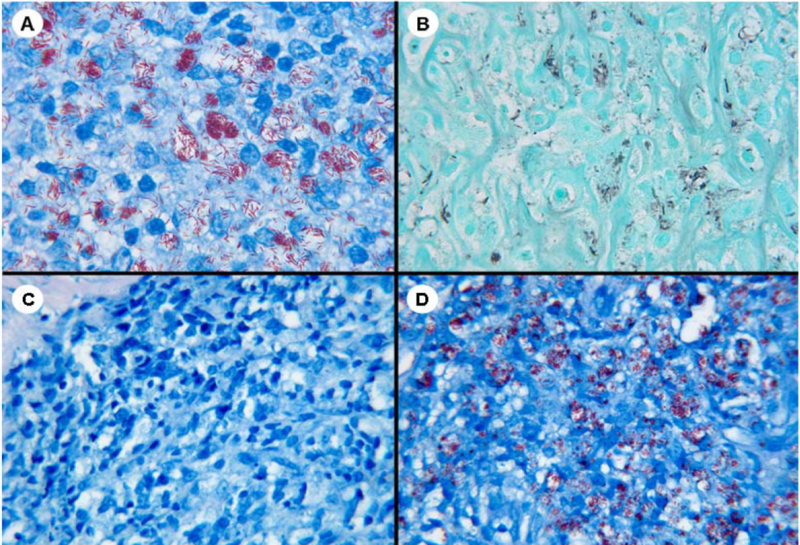 The histological diagnosis of leprosy type 1 reactions: identification of key variables and an analysis of the process of histological diagnosis. J Clin Pathol 61(5):595–600. ^ Wemambu SN, Turk JL, Waters MF, Rees RJ. 1969. Erythema nodosum leprosum: a clinical manifestation of the arthus phenomenon. Lancet 2(7627):933–935. ^ Mabalay MC, Helwig EB, Tolentino JG, Binford CH. 1965. The histopathology and histochemistry of Erythema Nodosum Leprosum. Int J Lepr 33:28–49. ^ Moschella SL. 1968. Primary diffuse lepromatous leprosy with erythema necrotisans (Lucio phenomenon). Arch Dermatol 97(5):593–594. a, b Rea TH, Jerskey RS. 2005. Clinical and histologic variations among thirty patients with Lucio’s phenomenon and pure and primitive diffuse lepromatosis (Latapi’s lepromatosis). Int J Lepr Other Mycobact Dis 73(3):169–188. ^ Velarde-Felix JS, Alvarado-Villa G, Vera-Cabrera L. 2016. “Lucio’s Phenomenon” associated with Mycobacterium lepromatosis. Am J Trop Med Hyg 94(3):483–484. ^ Fite GL. 1941. The vascular lesions of leprosy. Int J Lepr Other Mycobact Dis 9:193–202. ^ Scollard DM, Joyce MP, Gillis TP. 2006. Development of leprosy and type 1 leprosy reactions after treatment with infliximab:a report of 2 cases. Clin Infect Dis 43(2):e19–22. ^ Scollard D, Dacso MD, Abad-Venida L. 2015. Tuberculosis and leprosy: classical granulomatous diseases in the 21st century. Dermatol Clin 33:541–562. ^ Burdick AE, Hendi A, Elgart GW, Barquin L, Scollard DM. 2000. Hansen’s disease in a patient with a history of sarcoidosis. Int J Lepr Other Mycobact Dis 68(3):307–311. ^ Abbas O, Bhawan J. 2010. Cutaneous perineural inflammation:a review. J Cutan Pathol 37(12):1200–1211. a, b Scollard D, Stryjewska BM. 2015. Leprosy. In Rose B (ed), UpToDate. UpToDate, Wellesley, MA. ^ Teixeira LO, Silva CMGCH, Akamatsu HT, Barreto JA, Soares CT. 2012. Neural relapse in multibacillary leprosy 6 years after end of treatment. An Bras Dermatol 87(2):305–308. ^ Rees, R.J.W. 1985. The microbiology of leprosy, p 44–46. In Hastings RC (ed), Leprosy. Churchill Livingstone, New York, NY. ^ Jopling WH. 1979. The saga of the skin smear. Lepr Rev 50(4):271–273. ^ Kumaran SM, Bhat IP, Madhukara J, Rout P, Elizabeth J. 2015. Comparison of bacillary index on slit skin smear with bacillary index of granuloma in leprosy and its relevance to present therapeutic regimens. Indian J Dermatol 60(1):51–54. ^ de Rijk AJ, Nilsson T, Chonde M. 1985. Quality control of skin smear services in leprosy programmes: preliminary experience with inter-observer comparison in routine services. Lepr Rev 56(3):177–191. ^ Vettom L, Pritze S. 1989. Reliability of skin smear results: experiences with quality control of skin smears in different routine services in leprosy control programmes. Lepr Rev 60(3):187–196. ^ Scollard DM, Gillis TP, Williams DL. 1998. Polymerase chain reaction assay for the detection and identification of Mycobacterium leprae in patients in the United States. Am J Clin Pathol 109(5):642–646. ^ Martinez AN, Talhari C, Moraes MO, Talhari S. 2014. PCR-based techniques for leprosy diagnosis: from the laboratory to the clinic. PLoS Negl Trop Dis 8(4):e2655. ^ Yan W, Xing Y, Yuan LC, De Yang R, Tan FY, Zhang Y, Li HY. 2014. Application of RLEP real-time PCR for detection of M. leprae DNA in paraffin-embedded skin biopsy specimens for diagnosis of paucibacillary leprosy. Am J Trop Med Hyg 90(3):524–529. ^ Corstjens PL, van Jooij A, Tjon Kon Fat EM, van den Eeden SJ, Wilson L, Geluk A. 2016. Field-friendly test for monitoring multiple immune response markers during onset and treatment of exacerbated immunity in leprosy. Clin Vaccine Immunol 23(6):515–519. ^ Bobosha K, Tjon Kon Fat EM, van den Eeden SJ, Bekele Y, van der Ploeg-van Schip JJ, de Dood CJ, Dijkman K, Franken KL, Wilson L, Aseffa A, Spencer JS, Ottenhoff TH, Corstjens PL, Geluk A. 2014. Field-evaluation of a new lateral flow assay for detection of cellular and humoral immunity against Mycobacterium leprae. PLoS Negl Trop Dis 8(5):e2845. ^ Silva EA, Iyer A, Ura S, Lauris JR, Naafs B, Das PK, Vilani-Moreno F. 2007. Utility of measuring serum levels of anti-PGL-I antibody, neopterin and C-reactive protein in monitoring leprosy patients during multi-drug treatment and reactions. Trop Med Int Health 12(12):1450–1458. ^ Hussain R LS, Kifayet A, Jamil S, Raynes J, Uqaili Z, Dockrell HM, Chiang TJ, McAdam KP. 1995. Clinical and histological discrepancies in diagnosis of ENL reactions classified by assessment of acute phase proteins SAA and CRP. Int J Lepr Other Mycobact Dis 62(2):222–230. ^ Miller RA, Shen JY, Rea TH, Harnisch JP. 1987. Treatment of chronic erythema nodosum leprosum with cyclosporine A produces clinical and immunohistologic remission. Int J Lepr Other Mycobact Dis 55(3):441–449. ^ Norman G, Joseph G, Richard J. 2004. Relapses in multibacillary patients treated with multi-drug therapy until smear negativity: findings after twenty years. Int J Lepr Other Mycobact Dis 72(1):1–7. ^ Sehgal VN, Srivastava G, Singh N. 2009. Histoid leprosy: histopathological connotations’ relevance in contemporary context. Am J Dermatopathol 31(3):268–271. ^ Murthy SV, Sudha MR, Thejaswini, Mannan K. 2011. De-novo histoid leprosy. J Lab Physicians 3(2):110–112. ^ Ebenezer GJ, Norman G, Joseph GA, Daniel S, Job CK. 2002. Drug resistant-Mycobacterium leprae—results of mouse footpad studies from a laboratory in south India. Indian J Lepr 74(4):301–312.